Editor's note: This piece has been adapted from essays posted on the author's blog The Grumpy Economist. Sclerotic growth is the overriding economic issue of our time. From 1950 to 2000 the US economy grew at an average rate of 3.5% per year. Since 2000, it has grown at half that rate, 1.7%. From the bottom of the great recession in 2009, usually a time of super-fast catch-up growth, it has only grown at two percent per year. Two percent, or less, is starting to look like the new normal. Even these large numbers understate reality. GDP per capita does not capture the increase in lifespan—nearly 10 years—in health, in environmental quality, security and quality of life that we have experienced. The average American today lives far better than a 1950s American would if he or she had three rather than one 1950s cars, TVs, telephones, encyclopedias (in place of internet), or three annual visits to a 1950s doctor. But even these less quantified benefits flow from economic growth. Only wealthy countries can afford environmental protection and advanced healthcare. We can afford to worry about global warming. India worries about 600 people per toilet, emphysema from burning cow patties, and easily treatable parasitic infections. Our ability to defend freedom around the world—even if we are wise enough to do it sensibly—depends on robust economic growth. If GDP had grown at 2%, not 3.5%, we would only be able to afford half the military we have today. The immense improvements in the quality of goods and many services we have today are part of the engine of economic growth. Looking forward, solving almost all our problems hinges on reestablishing robust economic growth. Tax revenue equals tax rate times income, and growth determines how much income there will be. The amount of tax revenue our government has available to pay off debt and to pay the ballooning social security and healthcare expenses depends almost entirely on economic growth. Larger tax rates can’t come close to raising that much money. For example, the Congressional Budget Office, making its regular gloomy analysis of the US long-run budget outlook, assumes 2.2% growth from now until 2040.3 But if GDP grew by 3.5% instead, even with no structural reforms at all, GDP in 2040 would be 38% higher, tax revenues would be 38% higher, and a lot of the problem would go away on its own. A 38% increase in Federal Revenue by higher tax rates or a 38% cut in spending are unlikely. Conversely, if GDP only grows 1%, GDP and tax revenues will be 26% lower than the CBO forecasts, which will force a fiscal crisis. Thirty-eight percent more income—or 26% less income—drives just about any agenda one could wish for, from strong defense, to environmental protection, to the affordability of social programs, to the welfare of any segment of the population, to public investments, health, and fundamental research. And 3.5% is only a return to the post-WWII norm. Pre-2000 economic policies were not ideal. If we achieve 4% or more growth, even greater benefits occur. Over long periods of time, economic growth comes from one source: productivity, the value of goods and services each worker can produce in a unit of time. In turn, productivity comes from new ways of doing things. New ideas, at heart; new inventions, new products, new processes, new technology; new ways of organizing companies; new and better skills among workers. Southwest Airlines figuring out how to turn a plane around in 20 minutes, and Walmart mastering supply logistics, are as much productivity growth as installing scanners or ATMs. Workers who know how to use computers rather than shovels produce a lot more per hour. Higher productivity typically comes from new companies, which displace old companies—and displace the profits of their owners, and the healthy pay and settled lives of their managers and workers. Southwest enters and either displaces the legacy carriers—Pan Am and TWA—or forces wrenching changes for survivors such as American and United. A&P displaced mom and pop stores. Walmart displaced A&P. Amazon may displace Walmart. Nobody likes the process. Everyone needs the results. Nothing other than productivity matters in the long run. A factor of three increase in income in 50 years, and the much larger rise in income and health since the dawn of the industrial age, dwarfs what unions bargaining for better wages, progressive taxes or redistribution, monetary, fiscal or other stimulus programs, minimum wage laws or other Federal regulation of labor markets, price caps and supports, subsidies, or much of anything else the government can do. More people working, and working longer hours, can improve income a bit, but soon runs in to an upper limit. Our grandparents worked long hours, but were much worse off than we are. Saving, investment and capital formation can improve income a bit, but its benefit is limited as well. A 1950 worker working with twice as many 1950 machines produces much less than a modern worker using current technology. Only new ideas, new products, new technologies, new organizations, and new skills produce such huge increases in prosperity. A debate rages among economists why America’s growth has slowed. Most commentators advocate one side of that debate, and advocate strong policies according to their favorite theory. Lots of new ideas and grand policy programs are being dreamed up. Someone putting together a policy program might feel they have to choose a side in that debate, or they might wish to let that debate settle, to identify the most important policies. Either approach is, I think, a mistake, given the urgency and magnitude of the problem, and given the likelihood that such a highly politicized economic debate will come to useful resolution anytime soon. Let us instead work on the simple, common sense things that everyone knows are broken, everyone understands are retarding growth, and that when fixed can increase growth. As opposed to looking for big magic bullets, new and clever theories, and ignoring the simple problems staring us in the face. Will this approach restore 3.5% growth? Will it bring us to 4% or more growth? Well, really, it doesn't matter. When we have a big problem, and we know simple steps will help that problem, we should take those steps. We should do so, especially, because most of these simple steps can be taken at no fundamental economic or other cost. Our economy is like a garden, but the garden is choked with weeds. Rather than look for some great new fertilizer to throw on it, why don’t we get down on our knees and pull up the weeds? At least we know weeding works! For another metaphor, our economy has become like a hoarder’s house. For a while he could get through the passages and keep life going, but now the junk is closing in. Well, rather than read the architectural magazines about just what the perfect house will look like, let’s get to work cleaning up the mess. Alas, such a common sense, weed-the-garden program has little attraction to many ambitious politicians. Many politicians want a big new program, big new laws and initiatives—a New Deal, a Fair Deal, a Great Society. They don’t see cleaning up the mess left behind by their predecessors as the way to getting one’s face carved on Mt. Rushmore, let alone to win an election. Economists like big new ideas and programs too. Nobody got a Nobel prize for saying, let’s take Adam Smith’s 250 year old classics to heart. Forming such a coalition and keeping it together is hard. It is the essence of what great politicians can achieve. Cleaning out the weeds also needs a large effort of simple governance. The President has to revisit and rewrite the mass of executive orders and memos. The Congress has to get serious and pass laws that are actually laws, not thousand page instructions for agencies to figure things out. It has to get around to repealing laws everyone understands are bad—the Jones act restricting shipping, the ban on oil exports, and so on—and reforming laws that everyone understands need to be reformed. It needs to actually follow its own budget law. The heads of agencies will have to renew the staff and reorient them to growth-oriented policy, and undertake a sweeping house-cleaning of regulations and procedures. They will have to implement managerial techniques such as pervasive cost-benefit analysis, regular retrospective review, and sunsets. All of this is hard too. But it is the basic work of competent, growth-oriented government. But giving in to that rhetoric is a mistake. The US, in fact, has one of the most progressive tax systems in the world. And the relatively minor costs of government assistance to truly poor, needy, mentally ill or disabled people are not major impediments to growth. The weeds choking the economy represent cronyist redistribution to wealthy people, well-connected industries, and other powerful groups such as public employee unions, and large transfers among middle income people (social security and Medicare). They are not, by and large, the result of genuine and effective redistribution from rich to needy poor. When the average person (voter) expresses concern over inequality, what they really mean is that they are concerned that average people are not getting ahead economically. If the average person were getting ahead, whether some big shot CEOs fly on private jets or not would make little difference. Conversely, the average voter, if not the average left-wing pundit, does not support equality of misery. If the average person continues to do poorly, it would bring them little solace for the government to tax away the lifestyles of the rich and famous. Long-term robust economic growth is the only way to deliver sustained improvements in the lot of average Americans, and the less fortunate in particular. Redistributing Marie-Antoinette’s jewelry did little for the average French farmer. The golden rule of economic policy is: Do not transfer incomes by distorting prices or slowing competition and innovation. The golden rule of political economics seems to be: Transfer incomes by distorting prices and regulating away competition. Doing so attracts a lot less attention than on-budget transfers or subsidies. It takes great political leadership to force the political process to obey the economic rule. The vast expansion in regulation is the most obvious change in public policy accompanying America’s growth slowdown. Most recently, under the Dodd-Frank act and the ACA or Obamacare, these two large segments of the economy have seen radical increases in regulatory intervention. But environmental, labor, product, and energy regulation have all increased dramatically as well. Sometimes, regulation slows growth in return for public benefits, such as environmental protection or transportation safety. One can argue whether it does so efficiently, but there is a purpose. Most economic regulation, however, is specifically designed to slow growth. The purpose of most economic regulation is to transfer money to a specific group of people, companies, or industry. It does so by slowing down new entrants, impeding competition, mandating uneconomic actions or cross-subsidies, slowing innovation, turning off price signals, distorting incentives, and encouraging waste. These are the tools of economic regulation, and they all impede economic growth. People often complain that there are too many rules and regulations, or that the cost of filling out forms is too high, that there is too much red tape, that there are too many lobbyists, or that the direct measurable costs on industry are too large. The economic impact of regulation goes far beyond these standard complaints. The overwhelming cost of regulation is the economic dislocation: companies not started, products not produced, innovations not innovated, people not hired, costs not slashed, prices too high. And growth too slow. Just because it’s harder to measure these costs does not mean that these are not the overwhelmingly more important costs, and the costs that we need to address. Economic regulation has left behind the rule-of-law framework that many Americans suppose governs their affairs. In the popular imagination, regulation is about rules, and there are just too many of them. In many areas, however, the regulations are so vast, so complex, self-contradictory and so vague, that they basically give the regulators free rein to do what they want. In many cases, there is not a set of rules that you can read and comply with. You need to ask for preemptive permission from a regulator, who determines if your project can go ahead. Delay in getting needed approval is as good as denial in many cases. Projects that cost millions cannot bear years or often decades of delay in getting approvals. In other cases, vague and expansive laws and regulations give regulators ammunition to pursue a few selected victims, to extort big settlements or send a few examples to jail. And by doing so to frighten the others into following the regulators’ commandments. In many areas just about everyone is in technical violation of some law or regulation. We are used to the right to see evidence against us, challenge witness testimony, and appeal decisions to an independent and higher court. These rights often do not apply to regulations, where the agency is prosecutor, police, judge, jury, and executioner all wrapped in one. The methods for determining an “abusive” practice or “discriminatory” outcome are not revealed ahead of time so that people could structure their actions in accordance with the rules. Much of this state of affairs is Congress’ fault, for writing long vague bills that devolve legal power to the agencies. But in an increasing trend, regulatory agencies are going far beyond even the clear limits of their statutory authority and writing rules or commanding outcomes clearly far beyond the plain language of the law. The EPAs expansion of carbon regulation and the definition of wetland are good cases in point. So “de-regulation” is also an inappropriate slogan. “Smart regulation,” or “growth-oriented regulation” are much better descriptors of what needs to be done. Financial regulation, even more transparently than other regulation, is just about who gives money and who gets money. Under the Dodd-Frank act, a highly regulated industry has become suffocatingly regulated. The Federal Reserve embeds hundreds of employees at each major bank, who pass judgment on every decision. The justice department and SEC routinely pursue banks and other financial institutions for multibillion dollar settlements, and now will pursue individuals with criminal charges. The fixed costs of running a compliance department are so high that it is nearly impossible to start a new financial company in the US. Just one new bank has been chartered since the passage of Dodd-Frank. The parts of the financial system that failed and were bailed out in 2008 — Fannie and Freddie, commercial banks — were already among the most highly regulated businesses in America. Regulation did not fail for being absent. Regulation failed for being ineffective. Alas, the basic structure of the Dodd-Frank act simply doubles down on the same basic design that has failed again and again: The government guarantees a wide swath of debt, by promise (deposit insurance) and by ex-post bailout. An army of regulators tries to keep banks and other financial institutions from exploiting the guarantee and taking too much risk, and clairvoyantly to forecast panics and take action to stop them. That’s like sending your brother in law to Las Vegas with your credit card, but asking his kids to keep an eye on him. The alternative is clearly laid out in many sources: Risky investments must be largely financed by issuing equity, not by borrowing very short term money. When that happens, the mass of regulation is simply not needed in order to stop financial crises. Then we will “only” face the task of removing needless regulations whose main purpose is to create subsidies and protections for various clienteles. The ACA, thousands of pages of law, tens of thousands of pages of regulations, and even more decision-making power by newly empowered regulators, such as the thousands of waivers given to individual companies, represents an enormous increase in Federal intervention in the market for healthcare and health insurance. Like finance, health was already highly regulated. And like finance, most of the ACA simply doubled down on the same basic regulatory structure that had caused so many pathologies before. The central problem of preexisting conditions was an artifact of regulation. In the ideal form of health insurance, you buy cheap catastrophic insurance when young, but the insurance policy can follow you as you age, change jobs, and move from state to state, and does not radically increase premiums if you get sick. Why don’t we have that ideal insurance? Because previous rounds of regulation outlawed it. In the 1940s the US government allowed tax deductions for employer-provided group insurance, but not employer contributions to individual insurance or individuals’ contributions to such insurance. By laws, insurance is not portable across state lines. Thus, there is no reason for anyone who might get a job or move to buy long-term individual insurance that protects against the emergence of pre-existing conditions. In response to the preexisting conditions problem, the ACA forces community rating — everyone pays the same price—tries to mandate healthy people to buy insurance, and steps up pressure on employer provided group plans, which are the source of the problem. Similarly, once insurance was tax deductible, there was an incentive to salt it up. You would not buy car insurance that “paid for” oil changes — especially if you had to deal with insurance paperwork each time. But with a tax deduction it’s worth buying health insurance that “pays for” routine small expenses. Then the government (state and local too) instituted mandates that insurance must “pay for”—and, of course, charge premiums to cover—all sorts of additional procedures, which makes insurance too expensive. We need to allow simple, portable, largely catastrophic, lifelong, guaranteed-renewable health insurance to emerge. Right now it’s illegal. To the extent that the government wishes to subsidize health insurance—and it should—then it should give straightforward vouchers, which people can use to buy insurance, or to fund health savings accounts. Such vouchers should take the place of Obamacare, Medicaid, and Medicare. Healthcare and insurance is not just distorted from the demand side—too many people paying with someone else’s money. The supply side is ossifyingly restricted as well. New hospitals, new clinics that specialize in cheaply providing one service well, new doctors, new nurses, new insurance companies, all find a wall of laws, regulations, and officials blocking their path. For a reason: To maintain the profits of and cross-subsidies provided by the existing incumbents. Non-profit status itself blocks efficiency: you can’t take over an inefficient non-profit, and non-profits can’t issue equity to make important investments. In reducing the cost and improving the quality of healthcare, efficiency is far more important than trying to avoid a competitive rate of return to owners. There are few places in the American government where one can witness inefficiency and growth-sapping regulatory bungling on the scale seen in our energy and much (not all) environmental regulation. Like much else in America, our government pursues conflicting aims. It tries to subsidize and drive down the price of energy. And then it tries simultaneously to regulate against our using energy in a hundred different ham-handed ways, from mileage standards for cars, energy efficiency standards for windows and appliances, special parking places for electric vehicles, $7,500 tax credits to subsidize $100,000 Tesla cars bought by silicon valley zillionaires, hundreds of annually extended tax credits for various energy boondoggles, and so forth. The poster child for inefficiency may well be the mandate for gasoline producers to use ethanol. Corn ethanol, it turns out, does nothing to help the environment: It takes nearly as much petroleum energy to produce it as it contains, in the form of fertilizer, transport fuel and so on; it uses up valuable land, which directly emits greenhouse gases, and contributes to erosion and runoff; it drives up the price of food. The only thing sillier was the mandate to include cellulosic ethanol, because the government mandated a technology that simply did not work. If you were wondering why we do this, it should come as no surprise that corn is produced by big companies in Iowa. If you need more evidence, note that the US also has heavy restrictions on the importation of sugar cane ethanol — as we restrict all sugar cane imports — which actually might be of some environmental benefit. The planet, of course, does not care whether corn is grown in Iowa or sugar cane in Brazil. Corn growers and sugar producers do care. Similarly, if you thought that subsidized production of photovoltaics and the various subsidies to putting solar cells on your roof, including the requirement that your fellow citizens buy electricity back from you at retail prices, are about the environment, you will be puzzled by our government’s heavy import restrictions on cheap Chinese made solar cells. Obviously, mother nature cares not where the cells are produced. Mother politics does. Energy and transportation policy seem to indulge flights of magical thinking. California, facing a drought, and not having built water projects in decades, is going to spend well over $60 billion dollars on a high-speed rail line. This is advanced in the cause of carbon emission reduction. And quite literally, the case has been made that by building the rail line, we will lower global temperatures, and increase rainfall. If on a dollars per ton of carbon saved the rail line fails elementary cost-benefit analysis, on dollars per drop of water created, it fails the magic vs. reality test. As this example makes clear, the Federal government is not alone. State and even local regulation is partly to blame as well. Strong zoning laws forbid people from building houses near where they work, and forbid them from building workplaces near where people live, and from building shops near either. An electric car driving 60 miles is much less energy efficient than living in a high-rise apartment, in a mixed residential/commercial neighborhood, and walking! A growth-oriented, and anti-cronyist energy policy is pretty simple. To the extent that the government wishes to reduce carbon emissions, impose a simple and straightforward carbon tax. In return, eliminate all the detailed mandates, subsidies, quantity regulations, and boondoggle unprofitable projects. If energy costs more, people will quickly figure out on their own what makes sense. Energy is an economic paradox, as it is so highly regulated, with so much government picking of technologies, but simultaneously has such a flat long-run supply curve and there are so many technological alternatives. A large price of polluting energy is the most efficient way to induce clean energy innovation; far more efficient than massive amounts of federally subsidized research and development to financially unprofitable businesses and bureaucrats picking technologies. And price-induced behavior changes can reduce usage much more easily than mandating fancier technologies. Paying some attention to turning off the lights when you leave the room is more efficient than mandating LED bulbs and leaving the lights on. If you are serious about carbon, let the words “nuclear power” pass your lips. We have sitting before us a technology that can easily supply our electricity and many transport needs, with zero carbon or methane emissions. New designs, if only they could pass the immense regulatory hurdle, would be much safer than the 1950s Soviet technology that failed at Chernobyl or the 1960s technology that failed at Fukushima. We are now operating antiques. And even with this rate of accident, nuclear power has caused orders of magnitude less human or environmental suffering than any other fuel. As important as carbon may be, our environmental policy has become obsessed with this one danger. But slow warming and sea level rise in 100 years are not the only, or possibly the main, environmental danger we face. Most of the large species going extinct—elephants, rhinos, lions, and so forth, to say nothing of the more numerous and less photogenic—will go extinct from human predation, poaching, and loss of habitat long before climate has any effect on them. Most of the world faces environmental problems far more pressing than climate. And by focusing on climate, our government is spending far too little time, research and money on small but catastrophic dangers such as global pandemics, crop failures, animal diseases, and so on. As in finance, the unexpected and swift dangers are more likely to cause a crisis than the slow moving widely anticipated ones. Our government and politicians keep repeating how much they want to “create jobs” and help Americans to work. A martian, parachuting down and studying our economy would come to the opposite conclusion. There are few economic activities in which the government throws more obstacles than that of hiring someone. Start, of course, with taxes: income taxes and payroll taxes are primarily taxes on employment. But the regulatory burdens of employment are larger still, as anyone who has tried to get a nanny legal will attest. Minimum wages, occupational licensing, anti-discrimination laws, laws regulating hours people can work, benefits they must receive, leave they must be given, fear of lawsuits if you fire someone, and so forth all impede the labor market. We are swiftly becoming a nation divided, as Europe is, between “haves” with expensive, highly regulated, full time jobs—that are inflexible for people who wish part time work—and often illegal, under the table, part time “gig” work. Companies have innovated around many of these distortions with contract workers, but the current fight whether contract workers, independent contractors (Uber drivers) and franchisees must be considered employees of the parent company threatens to undo all of that, placing another huge wedge in the labor market and segregation between well paid, hard to get, full time jobs and a larger pool of unemployed. The usual argument is that workers need protection of all these laws. Well, the supposed protections do cost economic growth, and they do reduce employment. How much do they actually protect workers? The strongest force for worker protection is a vibrant labor market — if you don’t like this job, go take another. The tightly regulated labor market makes it much harder to get a new job, and thus, paradoxically, lowers your bargaining power in the old one. At a minimum let’s revisit just how much protection is actually being given, and just what the cost in growth is, and whether it’s worth it. Perhaps one economic issue just about every corner of the political spectrum can agree on is that our tax code is a massively complex and broken mess, needing reform. Practically everyone agrees on the basic structure of a growth-oriented tax reform: Lower marginal rates—the extra amount of taxes you pay on an extra dollar of income determines the disincentive to earning that income. To raise revenue at lower marginal rates, broaden the base, i.e. remove exemptions and loopholes. And massively simplify the code. Admittedly, not everyone agrees that tax reform should be oriented to growth. The voices for higher taxes argue for redistribution or decapitation—removal of high incomes, even without benefit to lower-income people—freely admitting the growth consequences of high taxes are at least not positive. They just view distributional goals as more important than growth. Often, however, tax reform proposals sacrifice too quickly the principles of what a good tax system should be with perceived political accommodations to powerful interest groups. Economists should not play politician. We should always start with “in a perfect world, here is what the tax code should look like,” and accommodate political constraints only when asked to. Political constraints change quickly. Economic fundamentals do not. Which one, depends on who can get out of the way. While it is politically tempting to suppose that wealthy stockholders bear the burden of corporate taxation, they are in fact the most likely to be able to avoid taxation. While imposing a corporate tax may hurts existing stockholders, by lowering the value of the stock, there is no reason new investors will give the corporation money unless they can get the same after-tax return they can get elsewhere, and in particular abroad. Thus, new investment dries up until the company can pay the same after-tax return to its investors—by raising prices, lowering wages, or reducing scale to generate greater before-tax profits. In addition, these days the owners and investors of corporations are as much your and my pension fund as they are rich individuals. For all these reasons, eliminating the corporate tax is as likely to be more rather than less progressive. The higher prices a corporation charges hurt everyone. The lower wages corporations pay hurt workers. The income it passes along to its owners is subject to our highly progressive tax system. A growth-oriented tax system taxes consumption, not income. When we tax income that is saved, or the investment income that results from past saving, we reduce the incentive to save, invest, start companies and build them, vs. enjoy consumption immediately. One of the first theorems you learn in an economics class on taxation is that the right tax on rates of return is zero. A person-based consumption tax can be progressive. It is useful to collect the basic tax as a VAT. Then people in higher brackets can declare income and receive credit for investments. Taxing corporations rather than people and taxing income rather than consumption is behind many complexities of the tax code. For example, right now the corporate and individual tax rates must be at roughly the same level. If we tax corporate income less, then people rush to incorporate themselves. If we tax personal income less, the opposite. But if we tax consumption and not income, then there is no tax benefit to incorporating yourself. As another example, we only need special health savings accounts and college savings accounts because we tax income. If we taxed consumption we would just save for health, college, and retirement as we do everything else. In partial recognition of the distortions caused by taxing rates of return, our tax code includes an absurdly complex web of ways of getting around capital income taxes, from IRAs, Roth IRAs, 527(b), 401(k), special tax treatment of pension funds and life insurance, lower rates for long-term capital gains, and the various trust shenanigans of the estate tax. Removing the attempt to tax investment income would make all of these complex structures irrelevant. Then they can be removed, greatly simplifying the code. The economic distortions of the tax system result from the overall marginal tax rate, not each tax alone. The economic distortion due to taxation does not care that there are separate federal, state and local taxes. The economic distortion is the sum of all these. Start by producing one dollar more of value for your employer. Now subtract the corporate income tax, the payroll tax (social security, Medicare, etc. ), your federal, state, and local income taxes; the investment taxes, capital gains taxes or estate taxes paid between earning and consuming, and the sales taxes, excise taxes, property taxes, gas taxes and so forth that you pay when you buy something, to see how much of value you actually get in return for the dollar of value you provided to your employer. That’s the overall marginal tax rate. Far too much tax discussion considers federal income taxes alone as if the others did not exist. They do exist. I only half-jokingly suggested an alternative maximum tax. Add up all the taxes you pay, including all the taxes companies whose stock you own pay, to any level of government. If it’s above some high number—say, 70%—you’re done and have to pay no more. Why? Consider the mortgage interest deduction. Imagine that in the absence of the deduction, Congress proposes to send a check to each homeowner, in proportion to the interest he or she pays on money borrowed against the value of the house. Furthermore, rich people, people who buy more expensive houses, people who borrow lots of money, and people who refinance often to take cash out get bigger checks than poor people, people who buy smaller houses, people who save up and pay cash, or people who pay down their mortgages. A rich person buying a huge house in Palo Alto, who pays 40% marginal income tax rate, gets a check for 40% of his huge mortgage. A poor person buying a small house in Fresno, who pays a 10% income tax, gets a check for 10% of his much smaller mortgage. There would be riots in the streets before this bill would pass. Yet this is exactly what the mortgage interest deduction accomplishes. Charitable donations follow the same logic. Suppose Congress proposed to match private charitable donations with federal dollars. Rich people get 40% match, but poor people only get 10%. Not only would that cause riots, but then there would be a much closer eye on just what “charities” mean in today’s America if they received direct checks from the Treasury. We may moan at the complexities of federal expenditures, but there is at least some oversight. Charities spend tax money largely in the dark. The shenanigans of the Clinton foundation are only the most recent visible example of how “nonprofits” are often the latest scam in the American legal system. Notice how every sports star or celebrity has a charitable foundation? They are great ways to escape estate taxes and investment taxes as well as campaign finance laws. Your kids can serve as the executives of the foundation. Yes, universities (such as my employer) may suffer. Well, I started this essay with the idea that everyone must give up their little subsidy so that the rest will give up theirs. So too must academics. Americans remain generous. Even without a tax incentive, Americans will give to worthy causes, as they give now to political campaigns. Worthy charities, such as my employer, may even gain by substitution away from tax and political scams. In sum, the ideal tax system taxes people, it taxes consumption not investment income, and it taxes at a very low rate with a very large base. Why is this so hard? Because our political debate mixes different goals. The central goal of a growth-oriented tax system is to raise the revenue needed to fund necessary government spending at minimal distortion to the economy, and in particular minimizing the sorts of distortions that impede the growth process. A first objection comes from those who want to pair reform of the code with substantial rises in overall revenue. This has been the main stumbling block to tax reform under the Obama Administration. Second, our tax code mixes raising revenue with a host of special provisions designed to encourage specific activities and transfer income to specific groups or businesses. Objections come from those who what to preserve one or another subsidy, deduction, or exemption. Third, our tax code mixes raising revenue with efforts to redistribute resources across income and various demographic classes. The result is paralysis. The answer lies in separating the arguments. One could go so far as to separate the actual legislation. First, we should discuss the structure of the tax code separately from the proper level of revenues. Let us agree that we will eliminate deductions and exemptions and have three brackets. Start with a revenue-neutral code. But agree that we can separately and much more frequently adjust the rates, which adjust the overall level of revenues. Second, we should separate the tax code from the subsidy and redistribution code. Let us agree, the tax code serves to raise revenue at minimal distortion. All other economic policy goes into the subsidy code. And subsidies should be on-budget and explicit. So, you want a subsidy for home mortgage interest payments? Sure, let’s talk about it. But it will be an on-budget expense — we will send checks to home buyers if we do it. You want to give $7,500 to each purchaser of electric cars? Sure, let’s talk about it. But it will be an on-budget expense. We will send $7,500 checks electric car purchasers if we do it. Yes, advocates will object. Congress is not at all likely to appropriate money in this way! Tax credits and deductions are very useful for hiding things like this. But again, honest political leadership should say, if we have to hide what we’re doing from the American people, then we shouldn’t be doing it. Or, we should structure it in a way that is acceptable. This discussion reflects another reality: The size of the US government is vastly greater than we think. It looks like Federal spending is only about 20% of GDP. But each deduction and mandate is the same thing as a tax and a subsidy. By bringing each deduction and tax credit on budget, we can correctly see exactly the size of our government, and more wisely vote on that size. Even if my dream of putting all subsidies on budget fails, they should at least be conceptually separate parts of the tax code, and debated separately. The key is to keep the basic tax code focused on raising revenue at smallest possible economic distortion, and to argue separately about subsidies. The art of politics is, of course, bundling things in a way to get deals done. But it is clear that the current bundling is producing paralysis. Those on the left that wish to raise revenue suspect that those who wish to reform the tax code will not later allow a discussion on revenue, so they must hold reform hostage. Likewise with those who want subsidies. Rather than produce another bundled mess, a great politician should be able to promise an honest hearing on revenue and unpalatable subsidies to get a clean growth-oriented reform. Redistribution by our federal government fails because of its similarly chaotic approach. Discussions of progressivity consider redistribution through the federal income tax code forgetting about the smorgasbord of social programs and other taxes. Social security, Medicaid, food stamps, unemployment insurance, and so on and so on all overlap to an incoherent mess. These should be condensed into one coherent approach to helping lower-income Americans. You can redistribute, if desired, by checks as well as by differing tax rates. The central problem is again the tension between economics and politics. When a growth-oriented economist writes about taxes, the most important question is the distortion. What economic decision is distorted by taxes? If you produce $2 for your employer but only receive $1 in value, does that distort your decision to work, to take a job, or to invest in the skills needed for the job? Who gets how much money is really not that important to growth. When the political system discusses taxes, the only question is who gets how much money, subdivided into minute income, geographic, racial and industry categories. Nobody pays attention to the distortions. But the distortions lower growth, and it is the job of wise political leadership to move the public discussion in that direction. The current tax discussion understates, I think, the importance of simplicity in the tax code. A simple code makes its incentives transparent. A simple code vastly reduces compliance costs. And most of all, a simple code is much more clearly fair. Americans now look at the tax code and suspect — often rightly — that rich smart people with clever lawyers are getting away with things. Our voluntary tax code depends vitally on removing this suspicion. The Greek equilibrium in which each person cheats because he knows everyone else is cheating, corrosive far beyond its effect on revenue, can break out here too. Tax lawyers and economists often come up with complex schemes to achieve parts of the principles I advocate, without doing much violence to the current code. I think this is a mistake. People who look forward to late March and early April each year as a time to show their hard-won expertise should remember how much the rest of the country hates the experience. For example, rather than eliminate the corporate tax, some economists advocate having corporations notify each stockholder how much tax is paid on his or her behalf, and then the stockholder can deduct the corporate tax payments from his or her individual taxes. That achieves the same economic result, if the costs of filling out forms are zero. As another example, it seems politically easier to leave in place cherished deductions like health insurance, home mortgage interest, and charity, but limit the total amount of deductions any one person can take. That achieves the economic purpose. But this setup leaves intact a perpetual argument. Next year, let’s renegotiate a higher limit. Or let’s exempt my favorite deduction from the limit. 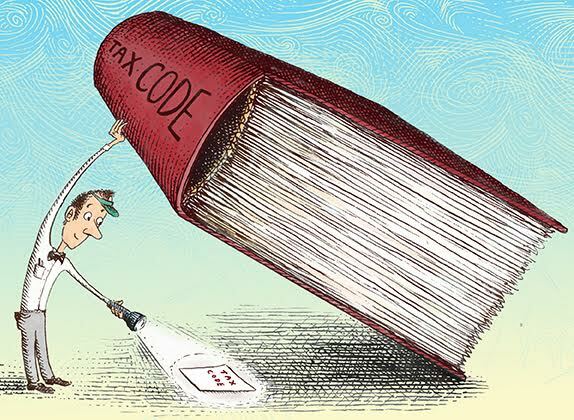 As long as each deduction remains in place, so does the constituency in its favor, and so do all the thousands of pages of tax code each entails. Eliminating whole sections of the tax code, rather than nullifying them with clever schemes, has another important advantage. A growth-oriented tax code operates by incentives, but people have to understand the incentives. Tax economists tend to be ultra-rational, and figure that people will react to the actual financial incentive even if it is quite hidden. Of course, the point of hiding it—of offering corporate tax rebates, say, rather than eliminating the corporate tax, or sharply limiting deductions rather than eliminating them—is precisely to fool people politically into thinking the provisions are still there. Well, people so fooled may not see the economic incentive either. Behavioral economists who argue that only very clear, simple, provisions have the appropriate incentives have a point. And their point argues for a simple code full of zeros rather than a complex code that has the same set of economic incentives once an expert combs through it. Debt and deficits are a looming threat to growth. Read any one of the nonpartisan Congressional Budget Offices’ long-term budget outlooks. Our central problem is straightforward: promises to pay social security benefits, Medicare and other healthcare will soon overwhelm the US budget. Hidden mountains of unfunded pension liabilities, state debts, student loan debts, and debts the US will incur if another financial crisis, recession, or war face us, add to the risks. Growth-oriented policy will do a lot to solve the debt and budget problem. Economic growth raises tax revenues without raising tax rates. Stagnant growth will make all these problems much worse. Conversely, a looming debt crisis or the extreme taxes that would be needed to pay for an unreformed system will be strong drags on economic growth. So, setting long-run spending in order now is both necessary, and much easier than doing it later. Indexing social security to price inflation rather than wage inflation takes care of much of the social security problem. Indexing it to the prices of things that old people actually buy helps even more. Changing the nature of healthcare support to vouchers, and enacting the other healthcare reforms mentioned above will give both better help to people in need and solve that budget problem. Both of these steps are much easier the sooner they are taken, so that nobody has to receive an actual cut in benefits. An economist should emphasize the distortions to economic decisions embodied by these programs, not the cost per se. Programs are bad when they require taxes so large that the taxes kill growth, or when the incentives of the programs sap people’s incentive to work, save, and invest. Social security should be converted to private accounts, not so much to save the government money as to ensure that each person knows that an extra hour of work, or extra effort made to learn a new skill or start a company, results eventually in greater resources for him or her, not just greater taxes. From a growth perspective, the most important characteristic of social programs is also not so much their cost, as it is their disincentives and their ineffectiveness. Most of our social programs phase out as income rises, often with hard steps at which if you earn one extra dollar you lose a large benefit. If you earn an extra dollar, you can lose healthcare subsidies, food stamps, social security, Medicare, disability payments, and a host of smaller subsidies from home heating oil subsidies, child care subsidies, transportation subsidies and even (in my home town) parking permit subsidies. There are so many programs and they interact in so many ways, that adding them all up is hard. The broad picture though is that for many Americans there is close to a one for one tax rate from zero up to $60,000 per year in the form of reduced benefits. The answer is not necessarily to be stingier. The answer, as elsewhere, is to design programs with more attention paid to marginal disincentives, and to design programs that fit together rather than assume each one acts in isolation. One good way to eliminate marginal disincentives is more frequently to condition support on time rather than income. Unemployment benefits work to some extent this way. Yes, you lose unemployment benefits if you get a job, which provides a disincentive. But you can only earn unemployment benefits for a certain period of time. It is surprising, in fact, that a society as fluid as ours conditions so much of its government activity on income, as if income were a permanent and innate characteristic. Income changes rapidly through time and over the life cycle. Social programs are so expensive because most of them are middle class subsidies, not help for the truly poor and desperate. We need to spend more is on the truly unfortunate. Schizophrenics in the streets are unbecoming of a great nation, and helping them costs relatively little. They don’t vote. We can end illegal immigration overnight: Make it legal. The question is, on what terms should we allow legal immigration. The immigration debate has nothing to do with who is allowed to come to this country. That’s the tourist visa debate. The immigration debate is about who is allowed to work in this country, and, later, who is allowed to become a citizen. Our Federal government has a massive program in place to stop people from working. That is immigration law. Immigrants contribute to economic growth. Even if income per capita is unchanged, imagine how much better off our social security system, our medicare system, our unfunded pension promises, and our looming deficits and debt would be, if America could attract a steady flow of young, hard-working people who want to come and pay taxes. Aha, we can attract them! They’re beating the doors down to come. But then we keep them out. The most common objection is that immigrants steal American jobs. No, they create American jobs, just as a higher birthrate of Americans would do. Every immigrant is as much a consumer of things we produce, a buyer of houses and cars, a starter of new businesses, as he or she is a worker. Immigrants come to do jobs that are available, not jobs that Americans don’t have. They do work that complements those of Americans, and thus make Americans more productive and better off. We worry about immigrants using social programs. Fine, but why then is immigration skewed to family members, likely to use social programs, and excludes workers, least likely to use them? If the worry is that they’ll go on welfare, why on earth do we forbid them from earning a living? If social program overuse is a worry, charge a $5,000 bond at the border, require proof of $10,000 of assets and health insurance, and anyone who is convicted of a felony goes home. This fear does not excuse our immigration system. The status of the 11 million already here is a national embarrassment. 11 million people live in this country, work, pay taxes, buy food and cars and houses, and yet are deprived of legal protection, easily exploited by employers, afraid to even take airplanes, let alone not allowed to vote. If this were a racial minority, we would be scandalized. But immigration law is so dysfunctional that we need not discuss radical programs. Let’s fix the basic growth-killing pathologies that we all recognize need to be fixed. Start by letting in people who obviously contribute to the American economy and society. Ambitious young people come to the US to get degrees in medicine, engineering, and business. They want to stay, work, buy things from our businesses and pay taxes. They want to start businesses and hire people. We kick them out. The H1B visa lottery should simply be abandoned. Any high-skill immigrant should be able to stay. Any high-wealth immigrant should be able to stay. Immigrants often start small businesses that serve poor areas. Anyone who starts a business should be able to stay. People who came at a young age, have been through American schools, served in the US military, and know no other country should be able to stay. The immigration discussion is full of more nonsense than any other policy question facing the country. No, immigrants are in fact much less likely to commit crimes than Americans. No, terrorists come on tourist visas. They do not swim the Rio Grande and stop to pick vegetables for a few years before blowing things up. And we already spend more than twice—$13 billion dollars—on the border patrol than we do—$6 billion—on the entire FBI. They are “illegal” some say. Well, that’s easy to fix. Change the law, and they will no longer be illegal! Constructing a great Ice Wall on the border with Mexico is a canard. Immigrants come on airplanes and overstay tourist visas. As with taxation, the immigration debate needs to separate completely separate questions: Who is allowed to enter the country? Who is allowed to work here? These are completely separate issues. Restrictions on work do nothing to address security. Immigration and growth feed each other. Immigrants help economic growth. But conversely, the lack of economic growth is feeding a misguided but understandable resentment towards immigrants. How often must commenters on all sides of the political spectrum complain that America’s public schools are awful? They are particularly awful for people of lower income, minorities and new immigrants. The problem is not money. Study after study shows that America spends as much or more money on education than other countries, and experiment after experiment has shown almost no effect of showering money on bad schools. The culprit is easy to find: awful public schools run by and for the benefit of politically powerful teachers’ and administrators’ unions. (Don’t forget the latter! Teachers account for only half of typical public school expenses.) Education poses a particularly large tradeoff between profits to incumbents and economic growth, since education lies at the foundation of higher productivity. In addition, the costs of awful schools fall primarily on lower-income people who cannot afford to get out of the system. It is one of the major contributors to inequality. The solution is simple as well: widespread financing by vouchers and charter schools. As with healthcare, a vibrant market demands that people control their spending, and can move it to where they get better results. As with healthcare, the government does not have to directly provide a service in order to help people to pay for that service. But as with healthcare, a healthy market also demands supply competition, that new schools be allowed to start and compete for students. Higher education has been relatively healthy in the US, but Federal policy is busy making a mess of it. The correlation between more and more subsidy to higher education, the astronomical rise in tuition, and the leftward drift of campus politics towards support of a larger government is hard to miss. The Federal government took over the student loan market, and is busy creating a new debt bomb that will likely end in another mass bailout. Immigration restrictions are making it harder for students to access this, one of our great export successes. There is a strong correlation between college education and later income. That does not mean that more college education will automatically generate more individual income or more economic growth. To some extent, smart people who will earn more money anyway go to college, and smart people who know they will benefit from a college education go to college. To a greater extent, people who choose science, engineering, math, computer, or business majors go on to earn greater incomes. Those who study other subjects may profit personally from the experience, but generally do not go on to contribute as much to economic growth. Loans that are forgiven if one does not earn a higher income, or forgiven for students who go in to non-profit, social work, government or other low-paying work, or who do not work at all, are particularly troublesome from a growth perspective. Our growth needs to be revived by pulling a thousand little weeds. A selected few reminders and examples follow. We still have agricultural price supports, tariffs and quotas such as sugar and oranges. Trade is relatively free, but could be freer. And keeping trade open requires endless effort against the forces of protection. The opponents of free trade, and immigration, adduce long-standing fallacies, that one must constantly fight. When, say, China, sends us cheap manufactured goods, they take dollars in return. Every one of those dollars ends up buying an American export, or invested in America. Trade is not a “competition,” and our trading partners are not “competitors.” We win in trade when American consumers get to buy things more cheaply. The point of trade is not to increase exports. When Germany sent Greece Porsches in return for worthless pieces of paper, it was Greece that came out ahead in the deal, not Germany. That much of the nation’s infrastructure is crumbling is a common observation. And infrastructure supports growth. Low interest rates are a particularly propitious time to build infrastructure. So why is there less consensus for a large program to repair and build public infrastructure, including roads and bridges, but also bicycle paths, parks, airports, ports, and so forth? In large, part, I think, our government has squandered its people’s trust in its ability to carry out infrastructure projects in a cost-effective, well-planned, and timely fashion. Instead, voters are used to reading about bridges to nowhere, high speed trains from nowhere to nowhere, billion dollar cost over runs, decade plus waits for permits, massive consulting fees, and other pathology. The process of infrastructure investment needs a complete overhaul. To mention just a few, it is no surprise that costs spiral when projects must pay “prevailing wages” and obey set-asides for specific contractors, or when environmental review takes years. It is no surprise that projects are not repaired when federal funds pay for new construction but not repair. Federal funding diverts resources to rail, a charming but very inefficient mode of transport, over freeways, airports, buses, bus lanes or bus rapid transit, or other needed modes. Real time tolling, private toll roads, and congestion pricing are easy ideas, used successfully in other countries, but almost never here. So, yes, we need a growth-supporting infrastructure program. But our political leadership needs to show us it can construct infrastructure in a more competent, less politicized, way, focused on delivering the needed infrastructure at least cost to the taxpayer. There are two areas in which the government could spend some more money, in ways that would enhance economic growth. Our legal and criminal justice system is clearly becoming dysfunctional. This system is trapping many people already struggling with poor schools and job prospects. That we spend tens of thousands of dollars to house prisoners and next to nothing to train them to succeed when they exit guarantees their return. Even doubling resources, so that crimes in poor neighborhoods are routinely solved, so that people accused of crimes have speedy trials and reasonable representation, not life-destroying years waiting for cases to be heard, so that people who are imprisoned receive some basic help in dealing with the outside world, would cost little compared to the trillions we spend on middle-class social programs. The war on drugs is a massive failure. Not only is it leading to mayhem in poorer areas of the US, it is causing narco-states, corruption, violence, and poverty in our neighbors, and driving much immigration pressure. Al-Quaeda, the Taliban, and ISIS earn lots of money from drug trafficking. Legalization would drive them out of business far more effectively than war. The federal government has a role in financing basic research. Yes, 95% of funded research is silly. Yes, the government allocates money inefficiently. Yes, research should also attract private donations. But the 5% that is not silly is often vital, and can produce big breakthroughs. Like the military, there are a few things the federal government must do. We are falling behind on basic research investments. And FDA approvals take forever. And patent law is a mess leading companies to spend too much time on lawsuits. And anti-trust law is completely outdated, just throwing sand in the gears. And the NLRB and EEOC are making a mess of labor markets. And the FCC is going to turn the internet into the 1965 French telephone company. And—well, this could go on pretty much forever. There are a lot of weeds. Just turn to the Hoover research website, especially Economic Policy, Education, Energy Science & Technology and Health care tabs. Turn to Cato’s website and browse down the “Research Areas” tabs, especially the Education, Energy and Environment, Finance, Health Care, Regulatory studies, Tax and budget, and Trade and Immigration tabs. I have kept this essay deliberately free of a forest of numbers and citations for easy reading, but the numbers and citations are easy to find.